Carl Wilson, a 101-year-old World War II veteran, is honored at the city’s annual Veterans Day ceremony. Wilson is one of about 1 million surviving World War II veterans, according to the National World War II Museum's website. Evanston held its annual Veterans Day ceremony Tuesday, where city officials and residents gathered to honor those who serve and have served in the U.S. armed forces. 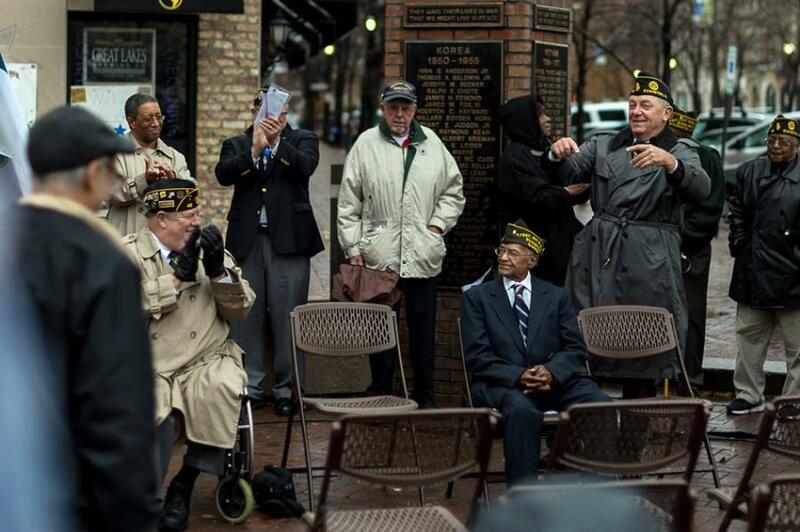 Veterans and residents, both young and old, attended the ceremony, which took place at Fountain Square at Orrington Street and Davis Street. Some spoke at the event, including Mayor Elizabeth Tisdahl. This year marked a special occasion for 101-year-old Carl Wilson, a World War II veteran who was a main honoree. Wilson said he grew up in Evanston and attended high school before joining the U.S. Army when he was 29 years old in June 1943. Wilson is one of about a million surviving World War II veterans out of the 16 million who served, according to the National World War II Museum’s website. During the ceremony, city officials and American Legion Post 42, an Evanston veteran organization, thanked veterans for their service to their country. Attendees faced east at 11 a.m. in a moment of silence to honor the armistice that was signed at that time on Nov. 11, 1918, to end World War I. After the moment of silence, “Taps” played while five veterans fired blank cartridges into the air to honor fallen soldiers. Veterans from different wars in American history attended the event, including Korean War veteran Adam Kwiecinski. Kwiecinski joined the military in 1951 at age 21 and now represents American Legion Post 42.